An art installation in neon on the right offset by a rainbow on the left. wonderful capture! 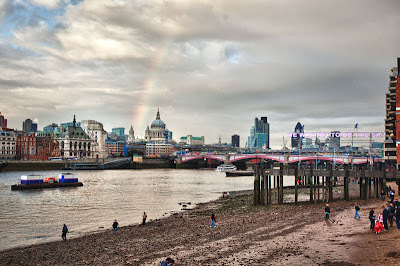 also, i love images of the thames at low tide. the shore comes a live with all kinds of people. I agree, nature's art is best. A lovely photo and the low tide adds to the atmosphere. Really gorgeous colours in this image Mo, it almost looks like a water colour painting, lovely. Dump the 'art and keep the rainbow. Those kids might well find items buried in that shore dating back hundreds of years! That area has been occupied for many years and things do turn up. Great shot of the rainbow, and it looks like the Thames treasure hunters were out in full force! The news about London in beautiful pictures, Mo.!!! This pic is like a masterpiece painting!!!!!wow! !yes i want to be this sky!!!! This shot is outstanding. A master piece. What a stunning photo!!! I love how the colours pop in that photograph, it is really lovely. It reminds me of a classic old beach scene from days gone by. Great. It looks like a retro image. Thank you for your comment. Peter.